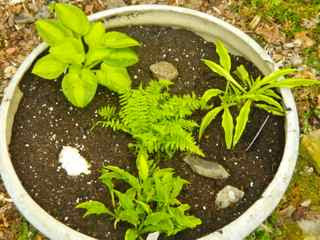 Miniature hostas are perfect plants for miniature gardens. 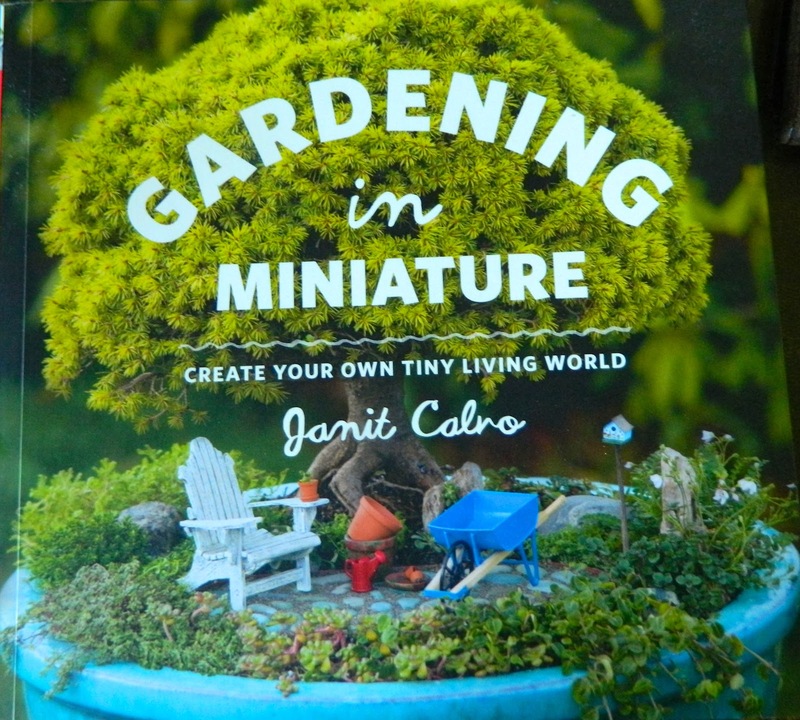 Gardening in Miniature: Create Your Own Tiny Living World by Janet Calvo is a complete guide to creating perfect small-scale gardens. Calvo clearly explains the various scales that can be used -- and for a math-challenged person (me) this is valuable information. 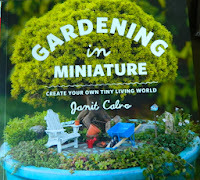 She reveals the secrets of designing in miniature. Calvo suggests suitable plants and miniature garden accessories. 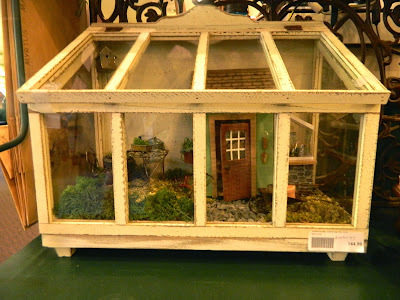 She discusses maintenance of your mini garden. The book is illustrated with a profusion of beautiful photographs. 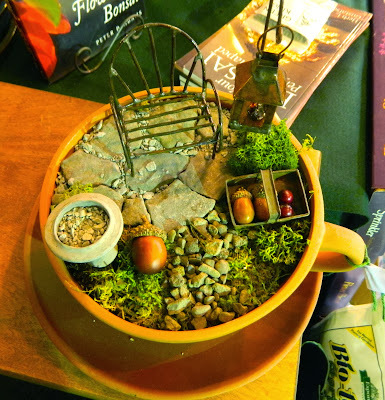 Fairy Gardening: Creating Your Own Magical Miniature Garden by Julie Bawden-Davis and Beverly Turner is similarly informative and also has gorgeous photographs. The authors discuss the importance of developing a theme and telling a story with your creation. They stress the importance of focal points. 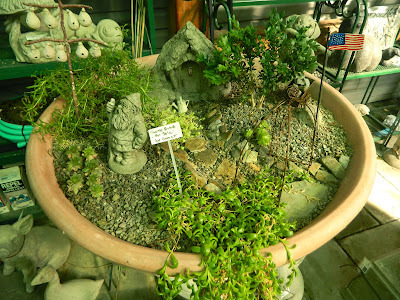 They give suggestions for containers as well as for miniature plants. 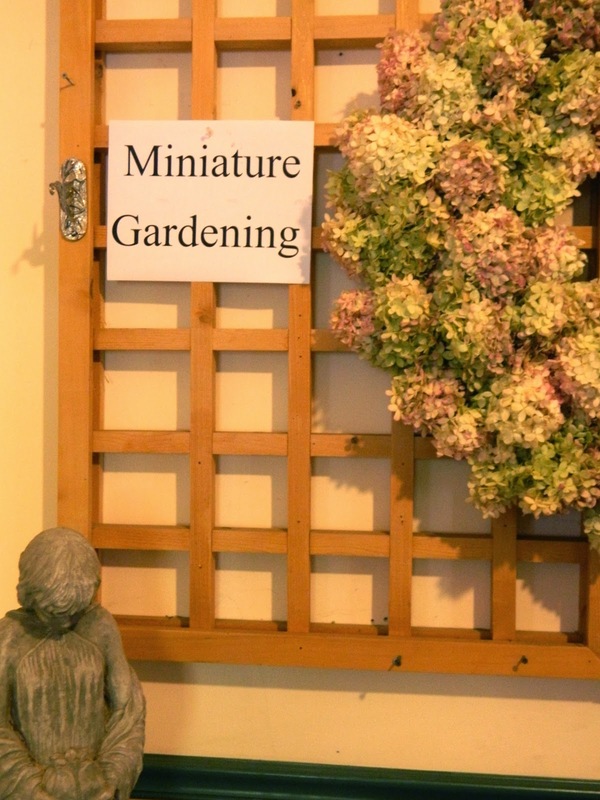 At the end of the book they provide a useful list of accessory and plant resources. Fairy Gardens: A Guide to Growing an Enchanted Miniature World by Betty Earl relates fairy lore and folklore and introduces plants associated with fairies. 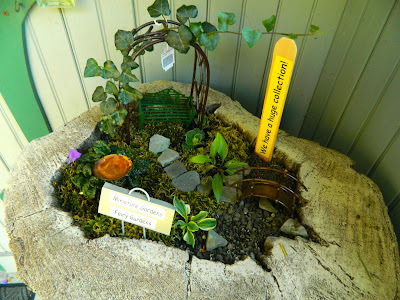 Earl discusses fairy houses and fairy doors (I would like a door at the foot of my old pear tree.) She begins each chapter with a quotation, my favorite, by Neil Gaiman, says -- "This is a work of fiction. All the characters in it, human and otherwise, are imaginary, excepting only certain of the fairy fok, whom it might be unwise to offend by casting doubts on their existence. Or lack thereof." I learned so much from each of the three books and I am enjoying planning my new creations! 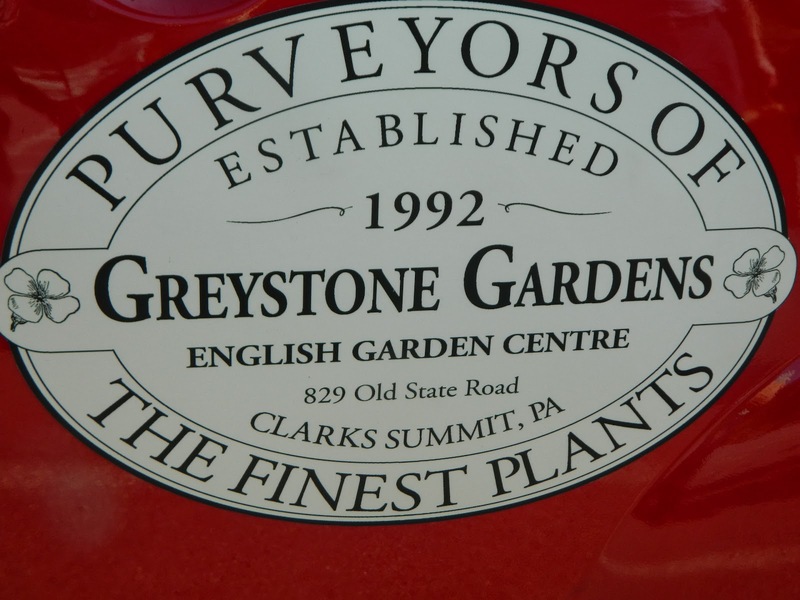 Look for 'Part 3' in the springtime. I am linking my book reviews to Holley at Roses and Other Gardening Joys. Thank you, Holley, for hosting this meme. 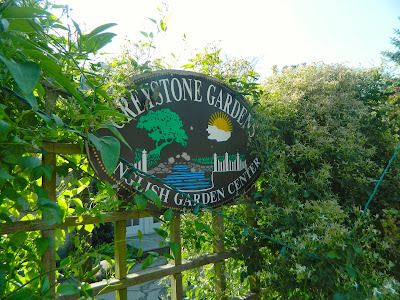 Thank you to all my friends in the world of garden blogging for your prayers and kind wishes during my recent illness. I am happy to tell you that your healing thoughts are doing the trick and I am well on the road to recovery. 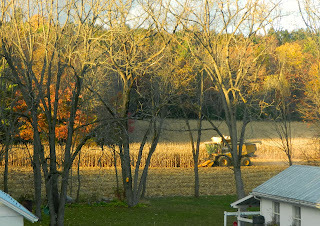 The corn was harvested Oct. 25. The end of the gardening season means time to plan the next. 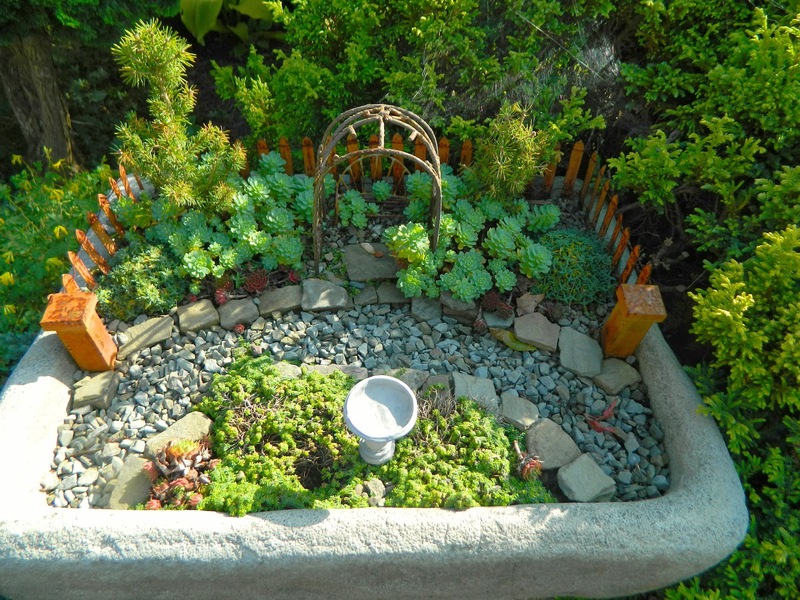 Miniature gardening, sometimes called fairy gardening, is my new and captivating hobby. I have been fascinated by fairies since, as a small child, I received my first 'Flower Fairies' book by Cicely Mary Barker. 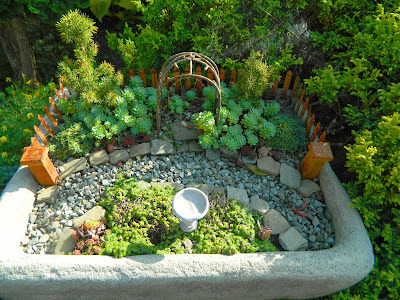 I find Barker's combination of flowers and fairies irresistible and now I am thrilled to unite the two in my own garden. 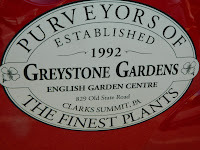 An English garden center -- appropriate don't you think? The gnome garden at the top of this posting was one of the first miniature gardens to catch my attention. 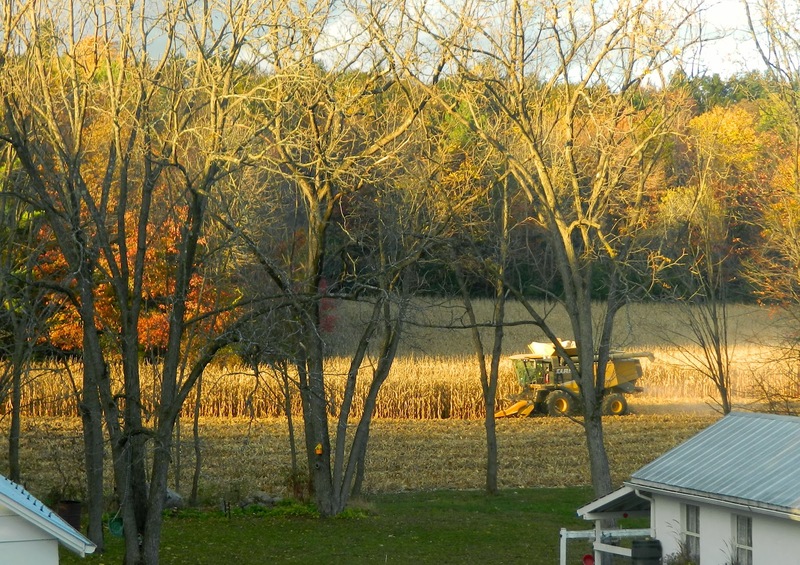 Notice the 'gourd' bird houses and his row of 'vegetables' in that picture. 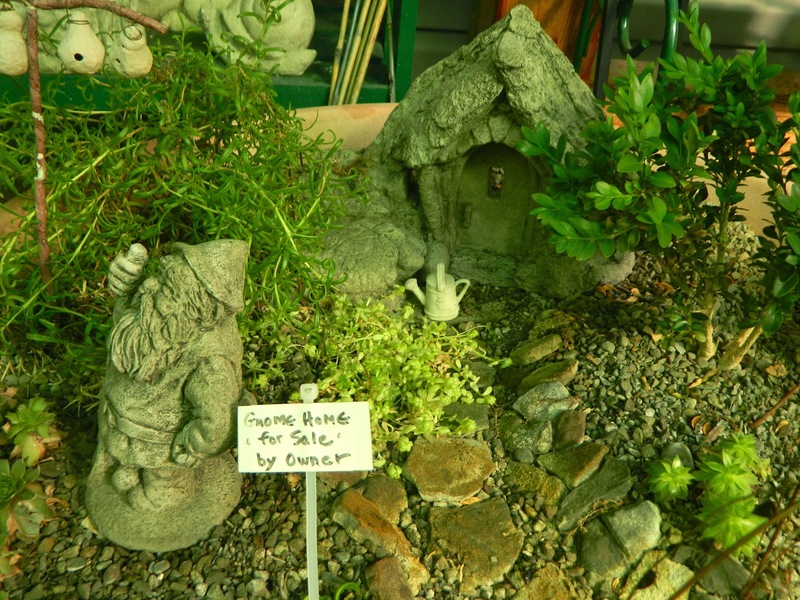 The sign in his garden says, Gnome Home for Sale by Owner. The gnome home was created in a large urn. 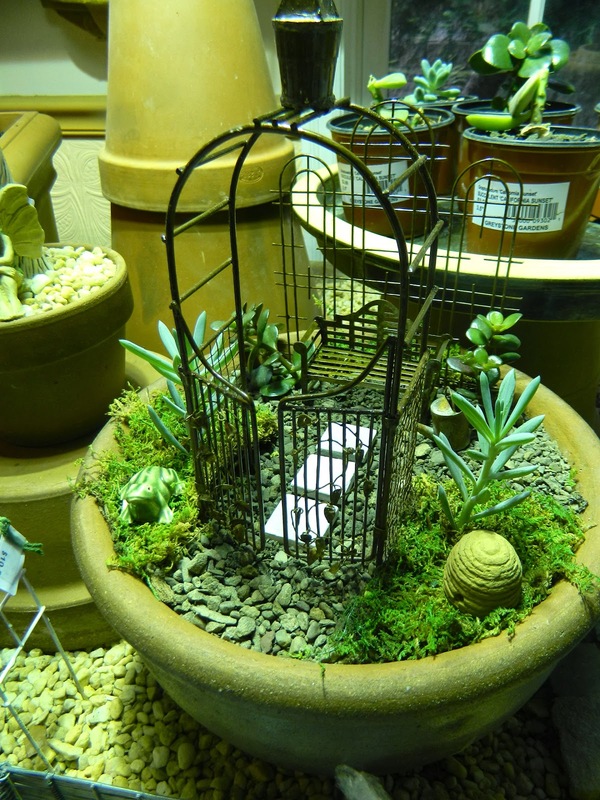 There were numerous container choices displayed such as hypertufa planters, glazed planters, and even a teacup planter. 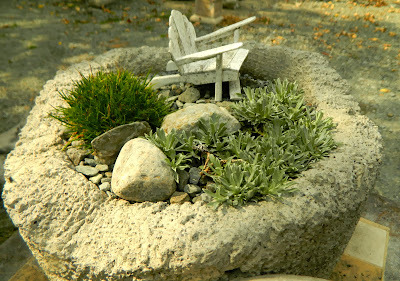 I have several hypertufa containers so this will be a good place for me to start my miniature garden collection. 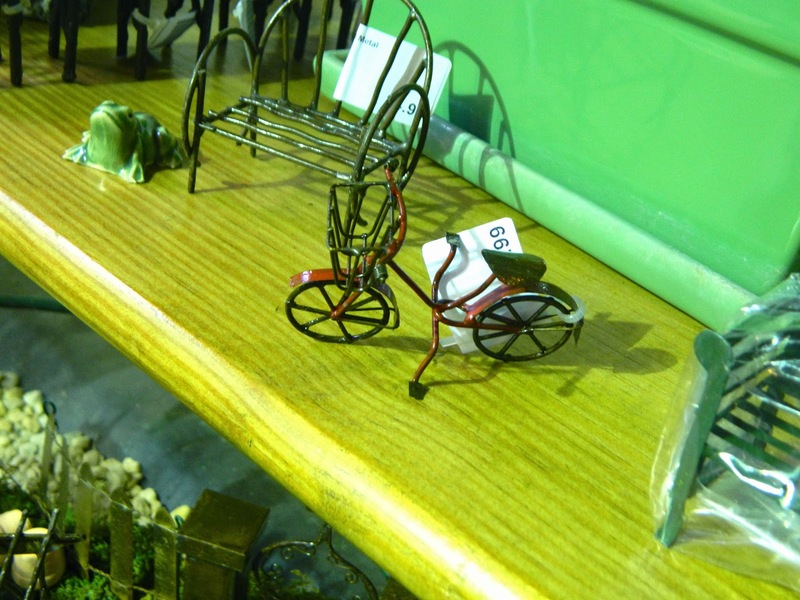 ... and this darling bicycle was my favorite. 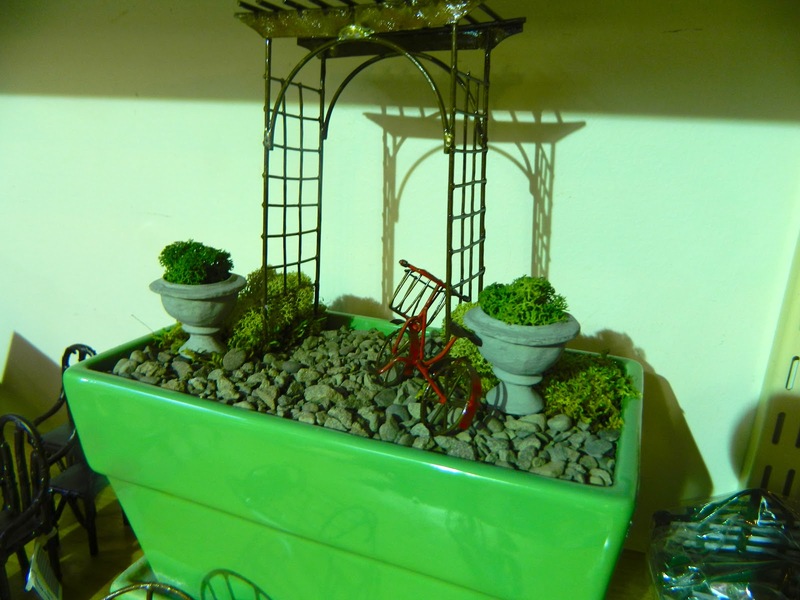 That sweet bicycle leaning against an arbor. There is a garden shed and garden inside this terrarium. None of the gardens shown here have fairies in them, but it is easy to imagine them stopping to rest on a bench or chair, or strolling along a path. 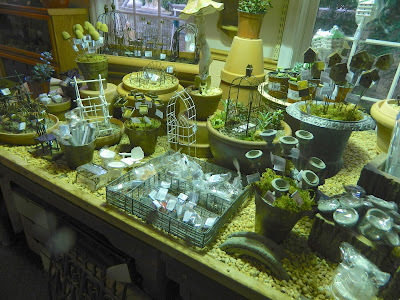 I couldn't control my shopping impulses and bought a couple of fairies, and several accessories. I forgot the bicycle though ... I'll just have to go back! In Part 2 of this series I will review some books that have given me more inspiration and practical advice. Part 3 will show how I will put it all together and build my first miniature garden. 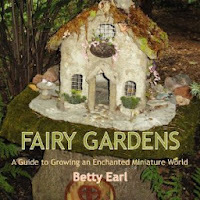 Betty Earl in her book, Fairy Gardens: a Guide to Growing an Enchanted Miniature World, says, "If this is your first fairy garden, remember that creating one that meets all your criteria can take time. There is no need to rush, as it can be completed in stages. Go slow and enjoy the process." As with all my gardening, winter is the time for planning, so I will make my first mini garden in the spring. In the meantime, I am enjoying the process! We saw snow today! Happy winter! 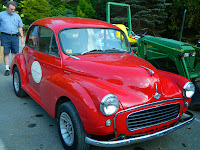 HH enjoyed the garden's classic car.